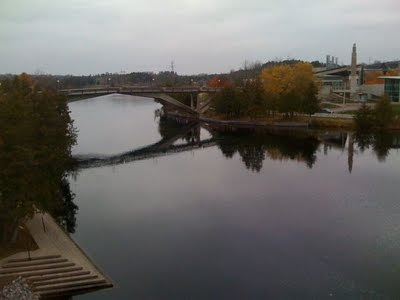 I am sitting in the Bata Library at Trent University and I have deliberately chosen a seat on the side of the library that I remember best, a seat suspended over the Otonabee River. As I begin to write about flow, my eye is caught by patterns moving on the river below. It is raining, and the rain spatters while the river flows, and there are disruptive swirls of foam making patterns on the river’s surface. At first glance, the picture is still, a portrait in shades of gray as my memories of Trent are of grey (my back is to the Peter Gzowski residence. I like that is is hugely yellow, a determined effort to bring sunshine, however artificial, into the gloomy grey of the academic year). But it only takes a second glance to notice that the picture is a pattern of constant and ever-changing flow. I know that flow can be dangerous. In my first year, a friend drowned in that flow. It’s a powerful current. One of the hardest paradoxes we face is in our relationships with the people closest to us. When we are uncertain, we need those relationships. Yet there is also tremendous possibility in standing back far enough to take a look at what is happening in those relationships. Watch two people together, any two people. To see them both without moving your head back and forth, you need to be standing ten or fifteen feet away. Socially, you are outside their circle when you are about six feet away, but visually you can't see them as a single unit until you get twice that far away. And you may have to get farther still to see the context around them so that you can tell what is integral to the relationship and what is coming in from outside. Lots of people talk about big goals. They talk about goals that stretch beliefs and capabilities and relationships. But for most people, really big goals are a little like lottery tickets: the purpose of the big goal is to give you a shot at a big win. A society grows great when old men plant trees in whose shade they will never sit. So much meaning is packed into that one sentence. Planting trees is not like making art that will last a hundred years (and more). Artists seek some kind of fame, some acknowledgment or justification or legacy. Often scientists seek the same kind of reward: we mark their discoveries with their names so that what they have achieved lives on after them. Someone is late and I have twenty minutes. I could surf the web or I could read. Or I could write a blog post. Instead of having extra time, I find myself with just enough time for something I didn't expect would fit into this day. Maybe it's appropriate that we had new windows installed in our house today. They are clean and shiny and they frame the view a little differently than the old ones did. It's the same view, but we're not in the same house. I wonder what you could do with twenty unexpected minutes. I daydream in blogs. When I write, I am connected with people I cannot see, people I may never have seen. That's a very daydream-y kind of concept. I sent a newsletter out this week with a thanksgiving message. But I have grown accustomed to the flexibility of doing things when I want and sending them out into the world immediately. I won't send this to my mailing list, but I want to say thank you. If I have trained you this year, thank you. Thank you because you let me see some part of you that is strong, or creative, or shy. Thank you because I learned from you and with you. If you are one of the many clients who is more friend than client now, thank you. You keep me going when it's hard to keep working. You make me smile. You reply to the blog exactly when I need a word of affirmation. You convince me that I am smart enough to work with people who are brilliant and resourceful and fun (people just exactly like you). I've been thinking (even more than usual) about what it means to support people in their efforts to make tangible, sustainable changes in their behaviour. In particular, I am pulling together information from a variety of experiences and sources about how to support change in people's automatic behaviours. If you've taken NLP programs with me, you know that the most elegant and sustainable change takes place at the level of presuppositions. When you change what feels "natural," you set in motion a whole range of behavioural changes with minimum resistance. Whatever learning is required seems to flow out of the change in defaults (the change in what feels like the natural state or attitude).